Following the successful launch of two mega catamarans over 100 feet each in 2010, the Sunreef shipyard has been designated as a builder of an 82ft double decker sailing catamaran with the latest design, featuring sleek hulls and a streamlined deckhouse topped with a giant 35m2 flybridge inspired by large superyachts. The European client, impressed by the elegance and unrivalled spaciousness of the 102ft IPHARRA, selected Sunreef’s original Double Deck design. The everlasting stylish look of the hull line is the result of Sunreef’s advanced design technologies and ongoing research into new solutions and inspirations. The Sunreef 82 DD has been designed with integrated stepped hull chines to increase interior space without compromising on performance. In the double deck concept there is one spacious owner cabin in the front, and a large, bright salon with an internal helm station enjoying sea views. This private yacht accommodates up to 7 guests in one beam-wide owner suite, one VIP queen cabin and one guest twin cabin convertible to a double cabin with an additional Pullman bed, attended by two crew to assist the owner, a sailor himself. An innovative element aboard the Sunreef 82 DD is the smart mezzanine floor housing a coffee table within a lounge area located on the starboard side of the main deck within the dining area. The owner suite, arranged over two floors, is set to occupy the entire forward section of the yacht with a master cabin, Jacuzzi and vanity on the main deck, and wardrobe and floor-to-ceiling storage and bathroom located below decks in port and starboard hulls respectively. Guest cabins are generously sized with three way access to a queen size bed with spectacular sea views through 6-part large windows, and have a separate bathroom and shower, spacious wardrobe, several lockers, a comprehensive entertainment system and air conditioning. Interior design has been customised following the owners’ suggestions, and combines light and natural colours and materials finished in a classic style. 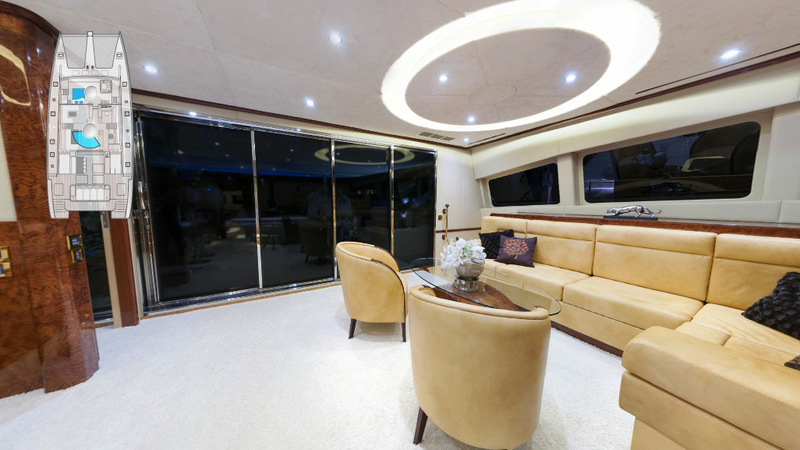 The impressive 64 m2 cockpit holds a large dining table for up to 8 guests, sunbathing mats, wicker armchairs, a flower area, and storage for diving equipment. There is additional space for a tender and a jet ski hidden in a purpose-built locker under the main sun pad in the cockpit. The spacious flybridge is fitted with the main helm station, bar with barbecue and ice maker, large dining table and comfortable deckchairs, as well as a coffee table. The Sunreef 82 DD superyacht was built of light high-tech composite materials that the shipyard introduced to construction in 2007. Her launch took place at the end of July 2012.